Front Suspension air/coil spring telescopic fork 160mm wheel travel. The Honda CB900C/CB1000 is a "custom"-styled standard motorcycle produced by Honda from 1980 to 1982. The slightly modified and larger displacement CB1000C was produced in 1983 only. It is a derivative of the DOHC CB750K at the supposed requests of the American consumer, according to Rider Magazine, March 1980. It is equipped with a handful of features that are unique for its time. These included air assisted suspension front and rear, shaft drive from the GL1100 Gold Wing of the same time period, and most notably, a dual range sub-transmission that allows the operator to "split" any of the five gears in the main transmission for a total of ten driveline ratios. The CB900C is closely related to the Honda CB900F and the 1983-only Honda CB1100F (both derivatives of the CB750 line). An air/oil cooled DOHC 902cc engine with 4 32 mm Keihin CV carburetors and electronic pointless ignition produces 84 BHP @ 8500 RPM. Front suspension relies on air pressure for preload while the rear relies more on air for the actual spring action. Three disc brakes arrest the momentum of the considerable curb weight as listed in the Honda factory service manual as 611 pounds or 277 kg. Both Rider and Cycle World reviewed this motorcycle in 1980 with varying degrees of disregard and dissatisfaction. The top complaints were the lack of purity in the "custom" styling and its effect on function regarding sport or spirited riding. The soft suspension was recorded as a hindrance to cornering ability as was the highly reactive shaft-drive/sub-transmission combination and the huge mass of the machine in general. Comparisons were made to tractor trailers. The bike garnered some appreciation from Cycle World for its styling and tank design. The genesis of the CB900C makes it a "parts bin" bike. 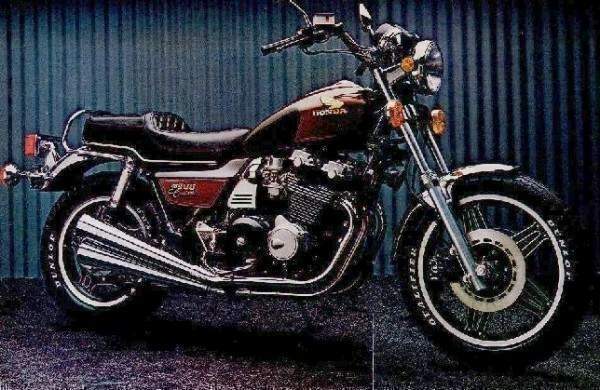 Honda produced two shaft drive bikes previous to and concurrently with the CB900C. The GL and CX series of touring motorcycles of the time are the source of the final drive and rear suspension assemblies of the CB900C. The European model CB900F supplied the basic frame extended two inches for the sub-transmission, engine, and many other chassis components. Full Hondaline touring equipment (Fairing, Lower Leg Fairings, Saddlebags and Trunk were available from the Honda dealer to make the CB900C a complete Touring Bike. The Sub-transmission is used as a "jack shaft". That is, in order for Honda to use the CB900F engine in conjunction with the GL swingarm and final shaft drive, power must be taken from the CB900F's left hand power take off and transferred to the GL's right hand side final drive shaft. The "Jack Shaft" was given 2 gear ranges at relatively low cost. Most CB900C riders use the 2-Speed Transmission more like 6th gear overdrive. Leaving the bike in low range while shifting through the normal 5 gears, then shifting into high range once up to speed on highway, reducing engine rpm significantly at touring speeds. Despite the lackluster treatment of the bike by the media some 27 years ago, the CB900 Custom has gained a small cult following. This phenomenon is not due to any one particular attribute of the cycle, but rather to a culmination of appreciation for its uniqueness (10 speeds), styling, comfort, reliability, and ample power output.